This entry was posted in Book Memes, Teaser Tuesdays and tagged book memes, r.m. 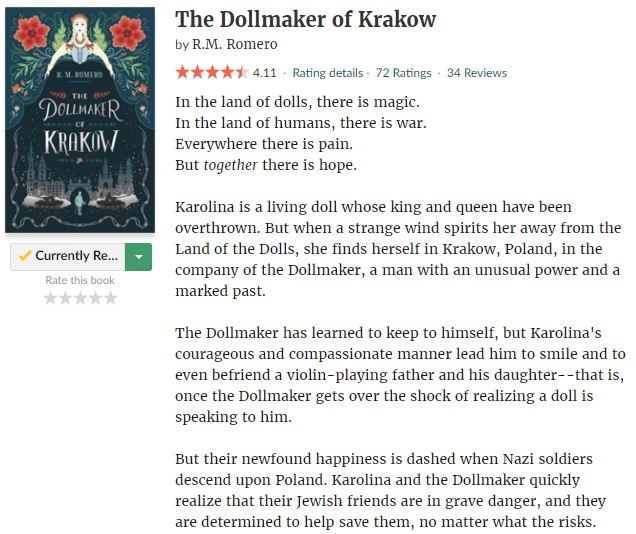 romero, teaser tuesdays, the dollmaker of krakow by Yvo. Bookmark the permalink. I like the cover as well! Hope it turns out a winner Yvo! It’s still early days but it is without doubt an interesting and quite unique read so far! I hope you continue to enjoy this one! Loved the quote! It sure has a lot of potential! The teaser reminds me of Pinnocio.. if it isn’t a retelling there must be some similarities. Sounds good, I hope you enjoy! Ah yes you are totally right! The story wasn’t exactly based on the original story (the doll isn’t turned into a real girl), but it does have a few similarities. All in all it was a very unique story!